Summary : The Shadow Fold, a swathe of impenetrable darkness, crawling with monsters that feast on human flesh, is slowly destroying the once-great nation of Ravka. I chose to give out copies of Shadow and Bone as a part of World Book Night 2016. There were a couple of books on the list that I was interested in, however I figured I should go something a little out of my comfort zone. So Shadow and Bone it was. I’d heard a lot of mixed reviews about it, some people were saying it was just an average YA fantasy book, so I was going in effectively blind. Alina is a normal girl, working for the army with her best friend Mal. That is until an attack on the army is underway and she is found to be one of the most powerful and prized people in the country. She is taken in to training to perfect her powers, where she is watched over by the Darkling. I don’t normally enjoy fantasy books, I find them hard to understand and get in to. However I really did enjoy this book. I wasn’t expecting to after I trudged through the first 50 pages thinking ‘who’s that?’ ‘what did they do again?’ and ‘how did she get there?’ but all of that evened out as you grasped who was who. It’s helped along by a trusty little map in the front (love a map in a book). The idea of the story was original, however you could point out the influences from a mile away. Sometimes I did feel like I was reading Harry Potter or the Hunger Games and it completely distracted me from the world. I found myself imagining other books, and where this felt like a comfort sometimes, it also took my attention away from the story. It is also a YA book, which means (you guessed it) YA tropes galore. I do enjoy YA books and I’ve found myself reading them an awful lot recently, however in fantasy writing they can be slightly annoying. There was the classic ‘I love him but he doesn’t know’ storyline, but that was to be expected. Even though there were a few clichés I didn’t enjoy, it didn’t take away from the great writing an even greater plot twists. 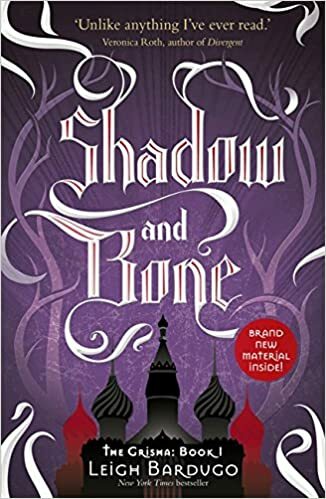 If you’re a novice when it comes to fantasy books, I’d start with Shadow and Bone, it’s the first novel in a trilogy so if you enjoy it, you can continue and dive deeper in to this style of writing. However I’m the first to admit that it’s not for everyone. Overall I really did enjoy this book and I’m more than glad that I picked it up. I got it read in just a couple of days so it’s definitely a quick read, I’d recommend it.